in the Advanced Geothermal Systems Session presented by the Red McCombs School of Business. 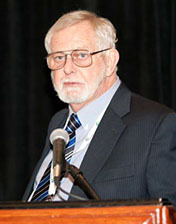 Saturated Gas, Inc. was formed to commercialize a new method to produce natural gas from methane saturated brine. The technology could be much "bigger" than shale gas within only a few years, because there is more natural gas saturated into brine in just Texas and Louisiana alone than all of the natural gas reserves in the entire world (including shale gas) and because potentially harmful horizontal drilling and fracing are not needed! This new oil and gas / geothermal co-production process extracts natural gas from methane saturated brine and generates emissions free electricity while remaining under constant pressure, which is a vast improvement over older technology that requires reducing the pressure to near atmospheric in order to remove the natural gas. 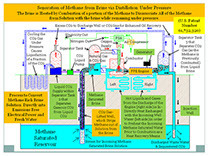 The Technology is capable of the conversion of methane saturated brine directly into emissions free electrical power; fresh water; and carbon dioxide capable of supporting enhanced oil recovery (EOR) projects or alternatively the CO2 gas is sequestered into the formation to generate power without any harmful emissions or other harmful environmental effects whatsoever. Do you own or have knowledge regarding deep wells in high pressure formations? Saturated Gas, Inc. is actively seeking JV Partners who either have wells that most likely posses brine solution that is supersaturated with methane that can be converted to use our technology or who wish to otherwise participate in our projects. To learn more about how much can be earned through licensing and using our technology and to explore how we can work together CONTACT US and request our Confidential Executive Summary. Our Logo Suitably is the Scientific Symbol for "Gas Saturation"